Review posted June 6, 2016. Millbrook Press, Minneapolis, 2015. 40 pages. Here’s a nonfiction picture book about science – with a practical problem of saving an endangered species. 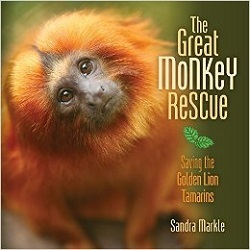 In the 1960s, scientists believed only about two hundred of Brazil’s wild golden lion tamarins were still alive. Their habitat was shrinking, and the ones in zoos were not having babies that survived. This book tells the story of how that turned around. First, people learned more about their habits in the wild to help them live better in zoos. Then they learned how to successfully introduce zoo-born tamarins back to the wild. A recent problem was that remaining forest habitats were in islands separated by cattle pasture, which tamarins couldn’t safely cross. Conservationists purchased land to plant a forest bridge between separate habitats, thus expanding their range. This story is told in a much more interesting way in the book, accompanied by an abundance of pictures of the photogenic animals. It’s a story about science and activism and hope – accompanied by adorably cute pictures! I’m already thinking I’ve got booktalking gold.